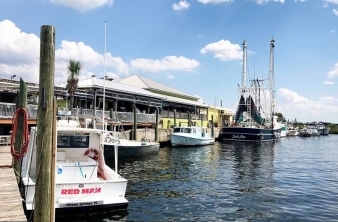 Just 45 minutes north of St. Petersburg and found along the shore of the Gulf of Mexico, Tarpon Springs was named for the fish found in abundance in nearby waters. But it also is known as the “sponge capital of the world,” and for its 51 miles of waterfront allure. In addition, its charming downtown center is listed on the National Register of Historic Places. Visitors to the Historic District can stroll along brick streets while browsing in art galleries, antiques stores, and specialty shops housed in buildings dating from the late 1800s. For the culturally-minded, the Tarpon Springs Performing Arts and Cultural Centers offer theater, local art, historical exhibits, concerts, and other quality programs. The city also boasts an active Greek culture and society. Many of the local buildings and homes feature Greek architecture, even the local campus of St. Petersburg College. Each January, Tampa Bay’s Greek Orthodox community celebrates the Epiphany. Nowhere in America is the feast of Epiphany celebrated as it is in Tarpon Springs where the ceremonies are identical to those taken place in and around Greece.